How does the Who Is Online system work? Updating Joomla to the latest version will fix this issue. Legacy is a new concept that is mainly used in Joomla 3.0 but also works in the latest 2.5 releases. Anyone with issue please check your Joomla version under Site/System Information and make sure it's the version below or newer. I cannot locate the field to adjust the time zone. Is this field available? Login to your Joomla back-end (yoursite.com/administrator). Select "Site" then go to "Global Configuration" from the top menu. Next select "Server" from the toolbar menu. Now under "Location Settings" choose your "Server Time Zone" from the drop down menu. Manual GEO upload but com_coalawebtraffic folder empty? 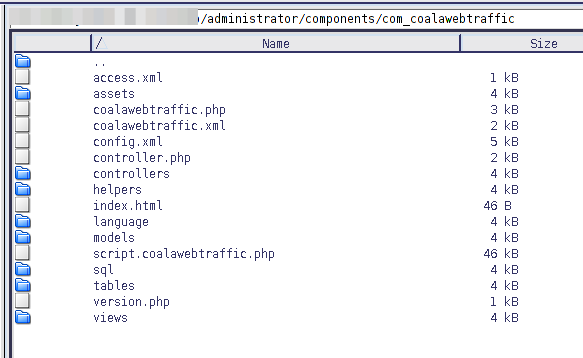 Note: This directory will be empty as there are no front end views for CoalaWeb Traffic. Then I recommend using the updated Guide and follow the steps exactly. This is due to a restructure where some of the options were moved from the module to the component. This was because there are now statistics displayed in the backend that rely on these setting as well as the front end module. Then clear your Joomla + Browser Cache. I'll explain a bit, in the early days of CoalaWeb Traffic I was using a similar method as Joomla's inbuilt module to display who was online but there is one major issues with that system and it's called sessions. This made the displayed user data very inaccurate as it was being stored for the length of a session as set in the Joomla system configuration. Checks if it already exist in the who is online database table. If it doesn't it will create a cookie and add the IP and date time to the database table. If it does it will update the date time in the database table. If more than 10 minutes has passed the database entry will be removed. The CoalaWeb Traffic module displays the users currently stored in the who is online database table.